Hypoxia is a feature of most solid tumors and is associated with poor prognosis in several cancer types, including breast cancer. The master regulator of the hypoxic response is the Hypoxia-inducible factor 1α (HIF-1α). It is becoming clear that HIF-1α expression alone is not a reliable marker of tumor response to hypoxia, and recent studies have focused on determining gene and microRNA (miRNA) signatures for this complex process. The results of these studies are likely to pave the way towards the development of a robust hypoxia signature for breast and other cancers that will be useful for diagnosis and therapy. In this review, we outline the existing markers of hypoxia and recently identified gene and miRNA expression signatures, and discuss their potential as prognostic and predictive biomarkers. We also highlight how the hypoxia response is being targeted in the development of cancer therapies. Abnormally low levels of oxygen in cells, known as hypoxia, characterize most solid tumors. Hypoxia is associated with malignant progression, invasion, angiogenesis, changes in metabolism and increased risk of metastasis. It also severely affects treatment outcome because hypoxic tumors are usually resistant to radiotherapy and chemotherapy [1–4]. Up to 60% of locally advanced solid tumors exhibit hypoxic (1% O2 or less, compared to 2 to 9% O2 in the adjacent tissue) and/or anoxic (that is, no measurable oxygen, < 0.01% O2) areas throughout the tumor mass. Studies in breast, uterine cervix and head and neck cancers suggest that the extent of hypoxia is independent of tumor stage, size, histology or grade . Hypoxia is caused by several factors: inadequate vascularization (tumor angiogenesis is often characterized by aberrant vessels that have altered perfusion); an increase in diffusion distances that is associated with tumor expansion (oxygen has to travel further to oxygenate tumor cells because of uncontrolled tumor growth); and tumor or therapy-related anemia (caused by reduced oxygen transport capacity) . Cancer cells can adapt to a hostile, low-oxygen environment and this contributes to their malignancy and aggressive phenotype. This adaptation is governed by many factors, including transcriptional and post-transcriptional changes in gene expression. In this respect, up to 1.5% of the human genome is estimated to be transcriptionally responsive to hypoxia . Several studies have attempted to characterize the tumor response to hypoxia and its prognostic implications. In particular, recent studies have identified gene and microRNA (miRNA) expression signatures (that is, lists of regulated genes or miRNAs) that are characteristic of this response. Here, we discuss these studies and focus on breast cancer as a type of cancer in which hypoxia has been shown to have clinical implications . We then discuss the use of these signatures in attempts to identify predictive markers of disease. 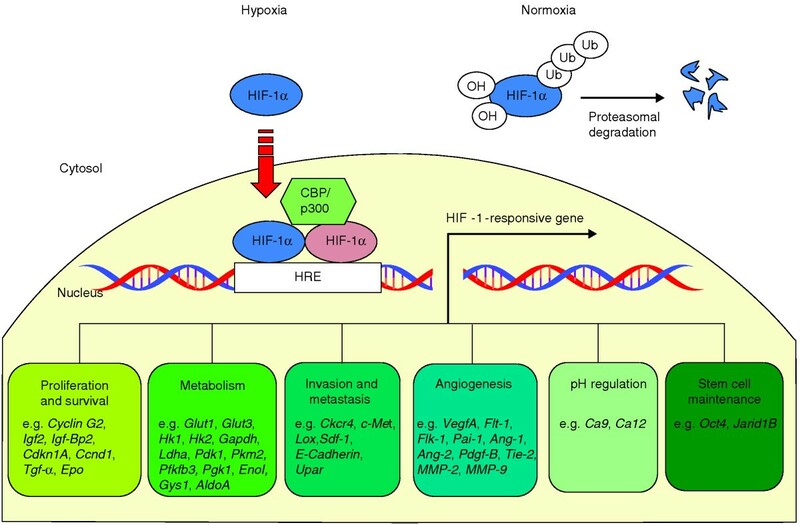 We also review the current approaches for targeting the master regulator of the hypoxic response, HIF-1α, in cancer treatments and the potential use of miRNA and gene signatures in this context. The master transcriptional regulators of the hypoxic response are represented by the family of hypoxia-inducible factors. HIFs are heterodimers formed by an oxygen- and growth-factor-sensitive subunit α and a constitutively expressed subunit β [7, 8]. In normoxic cells, the α subunit is recognized by and forms a complex with the von Hippel-Lindau protein (pVHL), which mediates its ubiquitination and degradation by the proteasome. In hypoxic cells, the α subunit is stabilized, it translocates to the nucleus where it dimerizes with the β subunit and activates the transcription of target genes by binding to the hypoxic-response elements (HREs) present in their promoter region [7, 8]. There are three isoforms of the α subunit, HIF-1α, HIF-2α and HIF-3α, and one β subunit, HIF-1β. HIF-1α is the isoform most ubiquitously expressed in cells, whereas HIF-2α and HIF-3α are expressed in a tissue-specific manner. HIF-2α is found mainly in endothelium, liver, lung and kidney, where it acts like HIF-1α on target genes. HIF-3α is highly expressed in thymus, cerebellum and cornea, where it acts in a dominant-negative fashion to inhibit HIF-1α and HIF-2α (for a review, see ). HIF-1 regulates key aspects of cancer biology, including cell proliferation and survival - for example, through regulation of Cyclin-dependent kinase inhibitor 1A (CDKN1A) and B-cell lymphoma 2 (Bcl2)/adenovirus E1B 19 kDa protein-interacting protein 3 (BNIP3); metabolism - for example, through Glucose transporter1 (GLUT1), GLUT3, Lactate dehydrogenase A (LDHA) and Pyruvate dehydrogenase kinase 1 (PDK1); pH regulation, through Carbonic anhydrase 9 (CAIX); invasion and metastasis, through C-X-C chemokine receptor type 4 (CXCR4) and Mesenchymal-epithelial transition factor (c-MET); angiogenesis, through Vascular endothelial growth factor A (VEGF-A); and stem cell maintenance, through Octamer-binding transcription factor 4 (OCT4) (Figure 1) . In particular, GLUT1 and GLUT3 are transporters that are involved in the uptake of glucose, the main source of ATP generation through glycolysis in tumor cells. HIF-1 can induce many of the enzymes in this metabolic pathway, which culminates with the conversion of pyruvate into lactate by LDHA . CAIX is a carbonic anhydrase located on the plasma membrane that hydrates CO2 to form H+ and HCO3- extracellularly . The secretion of VEGF by hypoxic cells stimulates endothelial cell proliferation and leads to the formation of new vessels from pre-existing ones (that is, angiogenesis), to provide additional perfusion . HIF-1α regulation in normoxic and hypoxic conditions and a selection of the genes, grouped by biological function, that are directly regulated by HIF-1α. Under normoxic conditions, the subunit HIF-1α is hydroxylized and rapidly degraded by ubiquitin-proteasome degradation. Under hypoxic conditions, HIF-1α is stabilized and is translocated to the nucleus. There, it binds to the subunit HIF-1β and the co-activator p300 and activates the transcription of target genes that are involved in several cellular processes, including proliferation, survival, metabolism, angiogenesis, invasion and metastasis, pH regulation and stem cell maintenance. Abbreviations: ANG-1, Angiopoietin-1; CA9, Carbonic anhydrase 9; CBP, CREB binding protein; CCND1, cyclin D1; CKCR4, C-X-C chemokine receptor type 4; c-MET, Mesenchymal-epithelial transition factor; ENOI, Enolase I; EPO, Erythropoietin; FLK-1, Fetal liver kinase-1; FLT-1, FMS-like tyrosine kinase-1; GAPDH, Glyceraldehyde 3-phosphate dehydrogenase; GYS1, Glycogen synthase 1; HK1, Hexokinase 1; HRE, hypoxic-response element; IGF2, Insulin-like growth factor 2; IGF-BP2, IGF-binding protein 2; JARID1B, Jumonji AT-rich interactive domain 1B; LOX, Lysyl oxidase; MMP-2, Matrix metalloproteinase 2; OCT4, Octamer-binding transcription factor 4; PAI-1, Plasminogen activator inhibitor-1; PDGF-B, Platelet-derived growth factor-B; PDK1, Pyruvate dehydrogenase kinase 1; PFKFB3, 6-phosphofructo-2-kinase/fructose-2, 6-biphosphatase 3; PGK1, Phosphoglycerate kinase 1; PKM2, Pyruvate kinase M2; SDF-1, Stromal-derived factor 1; TGF-α, Transforming growth factor α; TIE-2, Tie-like receptor tyrosine kinase 2; Ub, Ubiquitin; UPAR, Urokinase plasminogen activator receptor. Tumor type has an important bearing on hypoxia response; in breast cancer, evidence suggests that the expression of HIF-1α and its targets are key determinants of prognosis. High HIF-1α expression has been associated with poorer prognosis in several studies (Table 1) and a recent meta-analysis confirmed this . CAIX upregulation has also been associated with aggressive features and poor overall and relapse-free survival [14–16]. High expression of the HIF-1α target gene VEGF has also been associated with poor prognosis [17–19]. GLUT1 upregulation has been associated with increased risk of recurrence, higher-grade tumors and proliferation , and the expression of this gene is associated with perinecrotic (in close proximity to the necrotic core) HIF-1α expression . Increased expression of Lactate dehydrogenase-5 (LDH-5) has been associated with poor prognosis in endometrial, colorectal, head and neck and non-small-cell lung cancer [22–26], and the expression of this gene in breast cancer has been linked to HIF-1α expression . Interestingly, Rademakers et al. described a strictly cytoplasmic expression pattern for LDH-5 in head and neck carcinomas, which showed a strong correlation with hypoxia. On the other hand, Koukourakis and colleagues [22–27] have repeatedly described a mixed cytoplasmic and nuclear expression pattern for LDH-5 in different types of tumor, including head and neck cancer. Nuclear LDH-5 reactivity was linked with high HIF-1α expression, poorer survival and more aggressive tumors [23, 24], but its biological significance is still unknown. Trend toward unfavorable prognosis for HIF-1α (significant for LN- patients). BC, breast cancer; BCSS, breast cancer-specific survival; CI, confidence interval; LN+, lymph node positive; LN-, lymph node negative; DFS, disease free survival; HR, hazard ratio; NR, not reported; OS, overall survival. Other hypoxia signaling pathways have also been identified; examples are pathways activated by the mammalian target of rapamycin (mTOR) kinase and independent signals regulated by the unfolded protein response (UPR) in the adaptive response to low O2 conditions. In particular, mTOR is a sensor of metabolic signals that can influence cell survival and growth through changes in several signaling pathways that are involved in protein synthesis, autophagy, apoptosis and metabolism . Intriguingly, mTOR and HIF1 are reciprocally regulated, meaning that the deriving signaling pathways cannot be considered totally independent. Specifically, HIF1-α can inhibit mTOR through its targets Regulated in development and DNA damage responses 1 (REDD1) and BNIP3 [30, 31], whereas mTOR inhibition can result in increased HIF1-α translation, resulting in a regulatory loop . Hypoxia, as a negative regulator of mTOR signaling, could potentially act as a suppressor of tumor growth, but recent evidence suggests that this response to hypoxia is less pronounced in tumor cells than in normal cells, especially when the hypoxia is moderate (1% O2). Conversely, in the presence of more severe (≤ 0.1% O2) or prolonged hypoxia, protein synthesis and proliferation are inhibited in most cells as a possible way to preserve energy . Although there is still a paucity of good-sized clinical studies and there have been discrepancies between findings, a tendency of hypoxic tumor cells to be drug- and radio-resistant has been identified . Mechanisms of resistance include lack of oxidation of DNA free radicals by O2 (giving rise to resistance to ionizing radiation and antibiotics that induce DNA breaks), cell cycle arrest (giving rise to drug resistance), compromised drug exposure because distance from vasculature is increased (causing drug resistance) and extracellular acidification (also leading to drug resistance) (reviewed in ). HIF-1α activation has also been associated with resistance to endocrine therapy and chemotherapy . In a study involving 187 breast cancer patients treated with either neoadjuvant epirubicin chemotherapy or combined epirubicin and tamoxifen, both HIF-1α and its target CAIX were associated with treatment resistance . A further study of 114 breast cancers, which were treated preoperatively with aromatase inhibitor, showed that HIF-1α expression was an independent factor that was associated with treatment resistance . This concurs with earlier evidence that tumors with low CAIX expression benefit from adjuvant endocrine or chemotherapy treatment . In a study of 45 malignant astrocytomas, elevated CAIX was associated with poor response to combined treatment with bevacizumab and irinotecan . Elevated serum CAIX has been associated with reduced progression-free survival in metastatic breast cancer patients treated with trastuzumab . The HIF target GLUT1 exerts a cytoprotective effect by allowing increased glucose transport into hypoxic cancer cells, and its overexpression is common in breast cancer . In vitro studies with antibodies that block GLUT1 function, in conjunction with cytotoxic agents commonly used in breast cancer treatment, abolish proliferation in cancer cell lines, indicating a role for GLUT1 in treatment resistance . The HIF target gene VEGF has been associated with resistance to both hormonal and chemotherapies for breast cancer . There is a lack of general agreement on the effect of antiangiogenic therapy on tumor perfusion and hypoxia (reviewed in ), but some evidence suggests that antiangiogenic agents might reduce tumor oxygenation, inducing the activation of HIF-1 and its downstream targets and subsequently leading to tumor escape [45, 46]. These studies highlight the importance of assessing hypoxia. Although several studies have been performed on single genes, we could identify only one study that looked at the role of a hypoxia gene-expression signature in treatment response . This highlights the need for more comprehensive studies to investigate the expression of multiple hypoxia markers and of gene and miRNA signatures before and after treatment. Careful pharmacokinetic and pharmacodynamic analyses are also needed to derive markers of treatment efficacy or resistance. The finding of such research could not only allow the selection of patients who would benefit most from treatments, but could also avoid the use of specific treatments in cases where they might be detrimental . Given the role of HIF-1 in resistance to cancer treatments, the inhibition of this protein is an attractive therapeutic approach (Table 2). In vitro data suggest that small molecule inhibitors of HIF-1α in combination with adenovirus-delivered gene therapy might reverse the hypoxic chemo-resistance of cancer cells . Concerted attempts have thus been made to identify HIF-1 inhibitors using high-throughput screens. A better understanding of the HIF activation pathway could inform the choice of therapy, the individualization of treatments and the development of novel agents. Several of the cancer treatments already licensed for use, including the Topoisomerase 1 inhibitor topotecan, have been shown to inhibit HIF-1α protein accumulation in cell lines and xenograft studies [49, 50]. It may be that, in the clinical setting, such agents will have synergy with drugs such as bevacizumab, which is thought to cause treatment-induced hypoxia and subsequent HIF-1α activation that lead to drug resistance . Topotecan licensed for treatment of advanced lung, cervical and ovarian cancer. Several novel compounds are under investigation. Bortezomib is a proteasome inhibitor already approved for the treatment of hematological malignancies. A pharmacodynamic study in a metastatic colorectal cancer phase II trial observed downregulation of CAIX in response to bortezomib, suggesting a disrupted hypoxia response to this compound . Another novel compound, PX-478, inhibits HIF-1α transcription and HIF-1α protein levels in a p53- and pVHL-independent manner . YC-1, a synthetic compound, has been widely used in the laboratory setting to investigate the physiological and pathological role of HIF. In cancer cell lines, YC-1 inhibits HIF through factor inhibiting HIF (FIH)-dependent inactivation of the carboxy-terminal transactivation domain (CAD) of HIF-1α . A high-throughput cell-based screen has shown that another compound, DJ12, inhibits HIF-inducible transcription . Another approach demonstrated that ascorbate increases the activity of prolyl hydroxylase enzymes, leading to HIF downregulation, in cells treated with anti-surface transferrin receptor (TFR) antibody . The anti-HIF activity of two other novel anticancer drugs, AJM290 and AW464, has also been examined; both compounds inhibit HIF-1α transcription at the CAD and DNA-binding domains, although they also inhibit HIF degradation . Gene therapy that utilizes HIF-1α expression and the promoter regions of its downstream target genes (that is, HREs) would be an attractive approach. This might allow the targeted delivery of anticancer agents to tumor tissue. For example, it has been shown that hypoxic cells can be targeted by combining a HIF-responsive promoter with an oncovirus that is armed with the interleukin-4 gene. Treatment of xenografts using this technique led to maintained tumor regression . One group demonstrated that HIF-1α-based gene therapy can eradicate small EL-4 xenografts and also that this therapy augments the efficacy of the antiangiogenic agent angiostatin . Nevertheless, the great variability in the level of hypoxia, and hence HIF-1α expression, within a single tumor presents a challenge to such approaches. Methods that can reliably detect hypoxic tumors are crucial because of the roles of hypoxia in tumor prognosis and in resistance to specific treatments. Various methods are used to detect hypoxia in solid cancer tumors, but contrasting results have been reported . O2 measurement with a polarographic O2 needle electrode is the most direct method, but it has limitations, including its invasiveness, its inability to represent the whole tumor, and the possibility that it can generate false positive determinations as a result of oxygen consumption by the electrodes. In the clinic, the assessment of hypoxia is moving towards the evaluation of endogenous and exogenous markers. Immunohistochemistry is widely used in patient biopsies, and this method can detect both endogenous and exogenous markers of hypoxia. Among the endogenous markers, particular interest has been paid to HIF-1α and some of its target genes, including GLUT1, CAIX and VEGF. One limitation that is associated with these markers is their potential regulation by non-hypoxia-related factors (for example, pH or the concentrations of metabolites such as glucose and glutamine). Exogenous markers of hypoxia include nitroimidazole compounds derived from imidazole (for example, pimonidazole, 2-(2-nitro-1H-imidazol-1-yl)-N-(2,2,3,3,3-pentafluoropropyl)-acetamide (EF5)). These compounds need to be systemically administered to patients and generate stable adducts with proteins in hypoxic conditions; these can be detected by the use of specific antibodies on tumor biopsies. The main limitations of these methods are their invasiveness (they are performed on tumor biopsies), non-representative sampling (the tumor can be very heterogeneous and biopsies can be non-representative of the whole tumor), and the inability to perform multiple evaluations so as to follow changes in tumor oxygenation after treatment . A more recently developed technique for imaging hypoxic tumors that is now being implemented in the clinic is the use of nitroimidazole derivatives in combination with positron emission tomography (PET). Several derivatives of nitroimidazole are now being studied in order to identify the best tracer with high uptake and low toxicity [60, 61]. Among these, 18F-fluoromisonidazole (18F-MISO) is the most extensively studied, and it has an investigational new drug (IND) authorization from the Food and Drug Administration (FDA) as an investigational product for use in humans. Although the 18F-MISO-PET technique is non-invasive and allows the serial imaging of hypoxia, the accumulation of 18F-MISO in hypoxic tumors is relatively low. This results in a low signal-to-noise ratio and hence a poor contrast between hypoxic tumors and surrounding normal tissues (for a detailed review, see ). The imaging of tumor hypoxia by blood oxygen level-dependent magnetic resonance imaging (BOLD MRI) is also being investigated. This modality relies on the detection of paramagnetic deoxyhemoglobin within red blood cells, and does not require administration of exogenous tracers. The main limitations of this technique are the fact that it does not measure tissue pO2 directly and could be influenced by blood flow, tumor perfusion and other vascular parameters. In addition to these difficulties, it is becoming clear that assessing one single factor, such as HIF1, does not reflect the complexity of a tumor response to hypoxia, and hence is unlikely to be a reliable marker [3, 5]. More comprehensive approaches for the detection and selection of hypoxic tumors for therapy have therefore been investigated. The identification by global expression analysis of multiple genes (that is, gene signatures) and pathways that are responsive to hypoxia might overcome most of the limitations of current markers and other detection methods. Such gene expression signatures also have the potential to reflect the complexity of the tumor hypoxia response. They could, therefore, be used to reveal the nature of the hypoxic response to a specific therapy in terms of gene networks and hence improve our understanding of mechanisms of resistance. This would enable not only the identification of prognostic and predictive markers but also the selection of novel targets for therapeutics. Several groups have derived hypoxia gene expression profiles that have prognostic significance in breast cancer [47, 63–67] (Table 3). For example, Winter et al. defined an in vivo hypoxia 'metagene' (signature) in head and neck squamous cell carcinomas (HNSCCs) by clustering (that is, by finding) genes whose expression pattern was similar to that of a set of well-known hypoxia-regulated genes, including CAIX, GLUT1 and VEGF. The metagene contained 99 genes, several of which were previously described as hypoxia-responsive in vitro. These genes included Aldolase A (ALDOA), Glyceraldehyde 3-phosphate dehydrogenase (GAPDH), Placental growth factor (PGF) and BNIP3 as well as some new genes that could play an important role in the hypoxic response in vivo, such as Metaxin 1 (MTX1), Breast cancer anti-estrogen resistance 1 (BCAR1), Proteasome subunit α type-7 (PSMA7) and Solute carrier organic anion transporter family member 1B3 (SLCO1B3). This signature proved to be prognostic in independent HNSCC and breast cancer series . Some of these genes are being studied in ongoing follow-up studies. 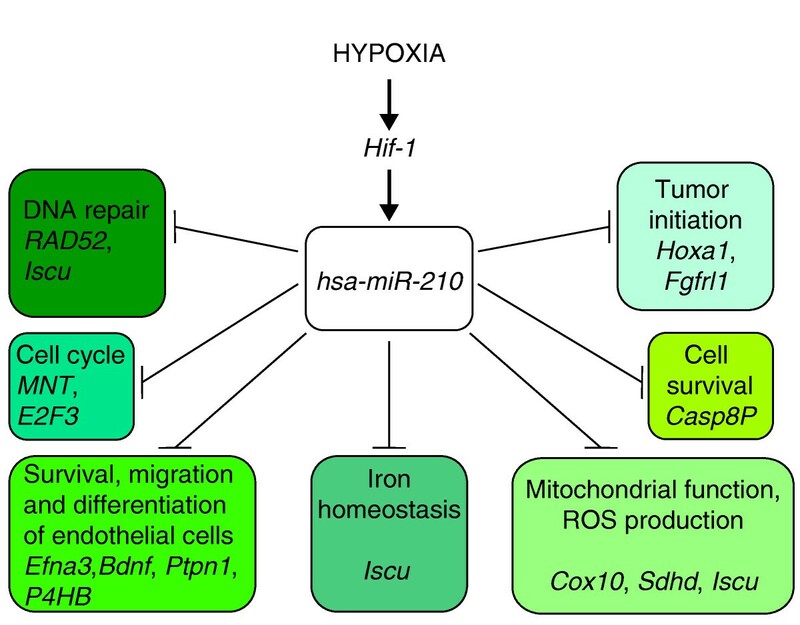 An example is Iron sulfur cluster scaffold homolog (ISCU), a gene that was downregulated in the hypoxia signature; this gene was subsequently found to be a target of the hypoxia-regulated hsa-miR-210 and a good prognostic factor . DSS, disease-specific survival; GSE, genomic special event; MSF, metastasis-free survival; NK, number of genes; NKI, Netherlands Cancer Institute; NR, not reported; RFS, recurrence-free survival. Chi et al. analyzed the gene expression profiles of mammary and renal tubular epithelial cells that were exposed to low O2 levels. They derived a signature called 'epithelial hypoxia signature' that presented coordinated variation in several human cancers. Of particular note, they found that a set of renal tumors could be stratified into two groups, one with high and one with low expression of the hypoxia-response genes. The high-hypoxia-response group included clear-cell renal cell carcinomas, which frequently present high levels of HIF-1α and/or HIF-2α because of the loss of functional pVHL. The signature could also differentiate between low- and high-signature-expression groups in a set of ovarian cancer samples and two different sets of breast cancer samples. In one of the breast cancer sets, Chi et al. found a significant association between high expression of the hypoxia signature and mutation in p53, negative estrogen receptor status and high grade tumors. In all of these sample sets, those patients assigned to the high-expression group had the worse prognosis. Finally, Chi et al. also showed that the generated signature was an independent predictor of poor prognosis, proving its potential in clinical decision-making. Seigneuric et al. used the data from Chi et al. 's study  to distinguish gene signatures in human mammary epithelial cells that are associated with early (1, 3 and 6 hours) hypoxic exposure rather than late (after 12 and 24 hours) hypoxic exposure. They showed that only the early-exposure gene signature had significant prognostic power, allowing the stratification of a cohort of patients with breast cancer into two groups: those with low expression of the early hypoxic response signature (better prognosis) and those with high expression of this signature (worse prognosis). More recently, Buffa et al. derived a hypoxia signature that is common to HNSCC and breast cancers. They used a meta-analysis approach to generate a more general and robust signature that might better reflect tumor response to hypoxia in vivo and be better suited for clinical use. They showed that a reduced metagene including as few as three genes (VEGFA, Solute carrier family 2 member 1 (SLC2A1; also known as GLUT1) and Phosphoglycerate mutase 1 (PGAM1)) had prognostic power similar to that of a large signature in independent breast cancer, HNSCC and lung cancer series. But they also validated a network-based approach that considers multiple hypoxia prototype genes, builds a co-expression network of hypoxia-related genes across clinical series, and then uses the network to generate biologically and clinically relevant hypotheses. For example, Buffa et al. showed that genes involved in angiogenesis (VEGFA), glucose metabolism (SLC2A1, PGAM1, Enolase I (ENOI), LDHA, Triosephosphate isomerase II (TPII) and ALDOA) and cell cycling (CDKN3) were among those most likely to be over-expressed both in hypoxic HNSCC and hypoxic breast cancers. These genes could all contribute to global survival pathways triggered by hypoxia in vivo. Despite cell-line diversity, the derivation of gene signatures using in vitro model systems can be powerful because some of the fundamental processes are conserved and clean experimental design can be easily applied. Conversely, the in vivo tumor system requires consideration of multiple cell types, microenvironmental changes and three-dimensional complexity. Approaches that integrate knowledge of gene function garnered from in vitro experiments with the analysis of expression in vivo might deliver signatures that better represent the hypoxia response that occurs in cancer. Gene signatures reflect the hypoxic response at the transcriptional level, which is only part of the story of the overall effect of hypoxia. miRNA signatures are therefore under investigation as post-transcriptional regulators of the hypoxic response. miRNAs are small non-coding RNAs that control gene expression post-transcriptionally by regulating mRNA translation and stability [69, 70]. The expression of miRNAs in tumors and normal tissues has been compared, and the differences have been found to affect cellular processes, including proliferation, apoptosis and metabolism, with the miRNAs acting as either oncogenes or tumor suppressors [71, 72]. Furthermore, changes in miRNA expression have been associated with clinico-pathological features and disease outcome in different tumor types, including breast cancer [73–76]. Several hypoxia-inducible miRNAs have been identified and two studies have focused their attention on breast cancer [77, 78]. Kulshreshtha et al. compiled a list of miRNAs that were consistently upregulated across a panel of breast and colon cancer cell lines exposed to hypoxia. Moreover, several of the miRNAs that were included in this signature were also overexpressed in breast cancer and other solid tumors, suggesting that hypoxia could be a key factor in miRNA modulation in cancer . The study by Camps et al. generated a short list of miRNAs that were induced by hypoxia in a breast cancer cell line. The cells were grown under conditions of either normoxia (21% O2) or hypoxia (1% O2) for 16 hours. Among the list of 377 miRNAs analyzed, they found that only four were significantly upregulated in hypoxia, with only three showing a greater than two-fold induction. Among these, hsa-miR-210 appeared to be the most robustly and consistently upregulated. This miRNA has been validated as a HIF-1 target [77, 78] and its expression levels significantly correlated with a hypoxia gene expression signature in breast cancer , suggesting that it is also regulated by hypoxia in vivo. Furthermore, hsa-miR-210 expression was prognostic in a study of 210 breast cancers . Great effort is now being directed towards unveiling targets that contribute to tumor aggressiveness. Comparative analysis of hypoxia-regulated miRNAs using gene expression profiles might add valuable information to the interrogation of target-prediction algorithms. Several targets have been investigated to date (Figure 2 and Table 4) showing roles for hsa-miR-210 in cell-cycle regulation, apoptosis, iron accumulation, the production of reactive oxygen species, cell metabolism, DNA repair, tumor initiation, and the survival, migration and differentiation of endothelial cells (Figure 2) [68, 79–87]. Of particular note, our group recently showed the major biological effects of miR-210 in targeting ISCU, all of which are likely to contribute to important phenotypes in cancer. By downregulating ISCU, miR-210 decreases the activity of Kreb's cycle enzymes and mitochondrial function, contributes to an increase in free radical generation in hypoxia, increases cell survival under hypoxia, induces a switch to glycolysis in both normoxia and hypoxia, and upregulates the iron uptake required for cell growth. Importantly, analysis of more than 900 patients with different tumor types, including breast cancer, showed that the suppression of ISCU was correlated with a worse prognosis . Cell functions modulated by hsa-miR-210 in hypoxia. See Table 4 for a full list of targets, full names and related references. Although most studies on miRNAs have focused their attention on miR-210, other miRNAs could contribute to the hypoxic response. For example, experimental evidence suggests that miR-26 and miR-107 might have roles in cell survival in a low-oxygen environment . A recent study has shown that miR-495 is robustly upregulated in a subset of a breast cancer stem cell population, both in stabilized cancer cell lines and in primary cells , where it promotes colony formation and tumorigenesis. Moreover, miR-495 is involved in maintenance of the cancer stem cell phenotype, in invasion by suppression of E-cadherin, and in hypoxia resistance through modulation of the REDD1-mTOR pathway. Finally, the ability to detect miRNAs (for example, hsa-miR-210) in plasma and urine, as well as in tumor tissues, further increases the clinical potential of these small molecules . Although this young field is undergoing rapid development, there are as yet no signatures that can be used in the clinical setting, but the results show that this area of research has great potential. Hypoxia occurs in most solid tumors, and has been associated not only with malignant progression and poor prognosis but also with specific resistance to anti-cancer therapies. Many biomarkers have been suggested for hypoxia, but they all have limitations. Furthermore, it is unlikely that a single-gene biomarker will be sufficient to characterize the complexity of a tumor's response to hypoxia. Several gene and miRNA expression signatures have also been suggested, and these have revealed commonalities and specificities of the hypoxia response in different experimental cancer systems both in vitro and in vivo. These signatures promise greater prognostic and therapeutic potential than single-gene markers, but the specific interactions between these signatures, the HIF response and responses to treatments remain unclear. A full understanding of these interactions is of paramount importance both when assigning the most beneficial treatment to patients and when designing new therapeutic strategies, such as combined modality treatments and multi-target or multiple-hit strategies. In this respect, the validation, optimization and assessment of these potential biomarkers in prospective clinical studies and randomized trials are increasingly needed to transform them into useful clinical tools. Elena Favaro, Simon Lord contributed equally to this work. The authors would like to acknowledge support from GlaxoSmithKline, Cancer Research UK, the Oxford National Institute for Health Research (NIHR) Comprehensive Biomedical Research and Experimental Cancer Medicine Centers, the Breast Cancer Research Foundation, and the EU 6th and 7th Framework Programs. EF, SL and FMB conducted a systematic review of the literature and drafted the manuscript. EF and SL prepared the tables and figures. FMB and ALH designed the study and revised the manuscript. All of the authors read and approved the final manuscript.